We Start mining early in the spring in Alaska. Water levels rise considerably during the summer months due to snow melt caused by higher temperatures making dredging extremely difficult. 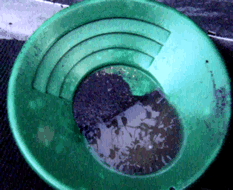 Although it can be done, it is much harder to access the "gut" of the stream where the richer gold bearing gravels tend to be. As many creeks and streams in Alaska are Glacier fed, there is also the problem of "glacial silting" causing poor visibility. This tends to make the water look like green milk on hot summer days! So, the best time to dredge for gold is spring and fall. 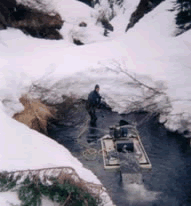 Some gold dredgers mine all through the winter in areas where the streams don't freeze solid. Our claims on the Kenai penninsula are at a high enough elevation that they freeze solid, which after a few mid winter dives does not bother me in the slightest. After sampling using the 4 inch dredge during the spring, we determined enough gold was present to warrant packing in our 6 inch production dredge. There is very limited access to our claims meaning we have to pretty much pack in everything by foot. 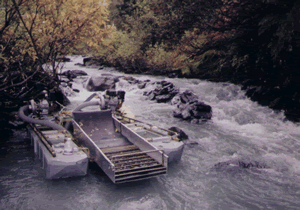 We use a Keene mini six inch dredge with twin 6.5 horsepower engines. This amounts to about 10 trips to hike in & out all parts to the dredge. This is why we sample first with the 4 inch. We started as soon as the snow melted in mid may, and had the dredge ready to go by the time the worst of the spring flooding had subsided in mid June. We were nicely surprised to find 2 nuggets both just shy of a quarter ounce each this season. One was found on the 4th of July, and the other in September. 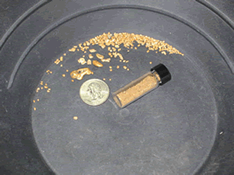 Gold Cleanup from July showing the July 4th "freedom Nugget" that weighed in at just under 1/4 ounce! 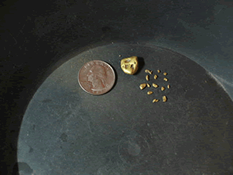 Gold dredged September 12th on Tincan Creek showing a 1/4 ounce nugget with smaller pickers! We did fairly well with our dredging operation in 2007. Though we did not strike it rich, we had a great time, and dredged several ounces worth of gold. I hope this helps to explain how some of the gold mining takes place in Alaska. We use much of what we mine in our jewelry settings. Because we find primarily smaller nuggets on our claims and the rarity of larger nuggets we purchase gold from miners throughout our state to meet the demands of our jewelry sales.